Mortise locks have been used to secure assets of humanity throughout history because of the lock’s strength and reliability. Today, mortise locks are generally used to secure various important assets and organizations. One mortise lock will efficiently function for a very long time. 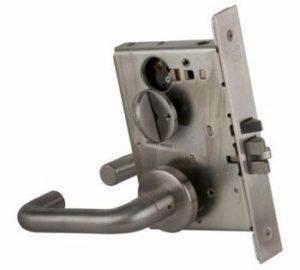 Mortise locks are widely used on commercial properties. The mortise lock can withstand a ton of mistreatment. Take a look at the bolt work inside of the lock body of a mortise lock. You will see that the mechanisms are large, and by holding the parts you can feel their weight as well. The size and weight of a mortise allows the lock to withstand more use. The interior components of a mortise lock are designed in the intention that they will be easily replaceable and serviceable.. These components are made of a solid metal construction with large springs that are built out of robust materials. The mortise is an accumulation of many different pieces that must be placed into a pocket in the door. These are the main features of a mortise lock that you may want to know in order to better understand the security that they can provide to you. Please be aware that there many additional features you can install on your lock to improve security further such as an electric strike or a hard collar. Lock Body – This is the housing for the components that will lock and unlock the lock, such as the springs and tumblers. Through Spindle – This thin, long rod goes through the handle/knob, the door and the mortise lock body. Lock Cylinder – This is a threaded cylinder that secures through the door into the lock body, so that when a key is inserted the door unlocks. Cam – Located inside of the lock cylinder, a cam is a rotating, rectangular piece of metal that manipulates the handle/knob ability to retract the latch. Strike Plate – This is a metal fixture that is fastened onto a doorway. It is lined up with the latch bolt and (possibly) the deadbolt that resides in the lock body of the mortise. When a mortise lock is installed, the body of the lock is placed into a pocket that has been cut into the side of the door. The cylinder gets threaded into the lock body, through the door, through the knob, and finally threaded onto the spindle. If the mortise lock has been installed correctly by a professional Portland locksmith, if you try turning the key inside of the cylinder will cause it to rotate a cam located on the back of the cylinder and this will unlock the latch. From here the handle /knob will retract the latch and the door will be unlocked. 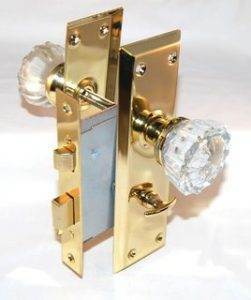 If you are the owner of a business office, mortise locks are probably the answer you have been looking for. Remember safety is the key, not only when a locksmith in Portland installs your locks, but also in the way you service and handle them daily. Never stop improving your home and business security.